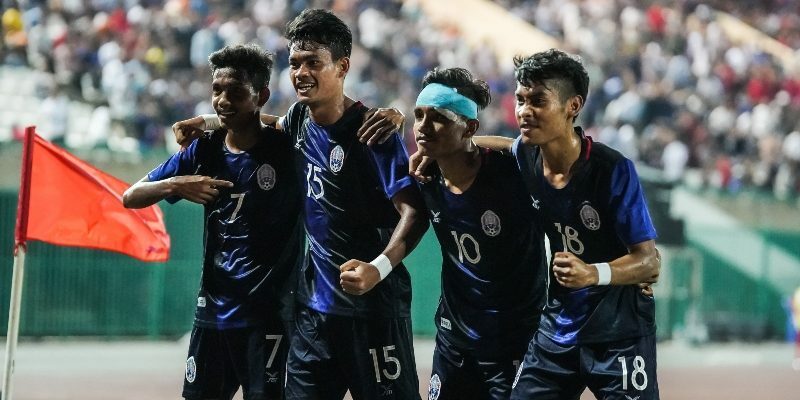 PHNOM PENH (20 Feb 2019) – Cambodia made it two out two as they beat Myanmar 2-0 in the second game of Group B to make the semifinals of the AFF Under-22 LG Cup 2019. A goal each in either half was enough for the Cambodians as they have now left it open for the remaining three teams – Myanmar, Indonesia and Malaysia – to battle for the runners-up spot. “I am overwhelmed with pride for the players. But we were prepared for this game against Myanmar. We are a 23-man team and the players did well,” said Cambodia head coach Felix Dalmas. Utilising an almost different set of players, Cambodia played with as much vigour as they had done in the first game against Malaysia. And tonight in front of more than 10,000 fans, the Cambodians certainly did not disappoint especially when it is considered that they had to carry on following the early injury to Mat Sakrovy just four minutes into the game. Not too long afterwards, sustained pressure saw them earning a penalty when Sin Kakada was fouled but Ouk Sovann totally missed from the spot as Myanmar keeper Phone Thitsar Min dove the right way. But that did not deter Cambodia as in the 27th minute, a cross from the left found the right finish from Yue Safy. Myanmar did not lose shape and five minutes later, they came close from a corner but Win Naing Tun’s attempt was blocked by a recovering defender as the score remained to Cambodia’s advantage at the break. Just five minutes in, Cambodia doubled their advantage with Khieng Menghou providing the corner and Sin Sophanat to finish from close range. The game went up a gear soon after as Myanmar search for their first goal while for Cambodia, they defended well and hard to deny their opponents. The frustration was obvious on the faces of the Myanmar players and after some persistent complaining, head coach Velizar Popov was red carded right at the end by Laos referee Xaypaseth Phongsanit to complete a woeful night for Myanmar. “We have a decisive game against Malaysia coming up. And we need to prepare well,” added Myanmar assistant coach Soe Myat Min.